Description: An erect, evergreen, coarsely branched tree that looks like a large branched candlestick or holder. It can grow to a height of 15 m. Branching is dichotomous (repeated branching into two equal parts) or trichotomous or irregular. Prop roots are numerous, thick and originate from the base of the trunk. Exposed stems are usually pale buff or grey brown, grossly ringed by leaf scars. Stems are hollow. Leaves are sword like, 1 to 2 m long and 4 to 7 cm wide, arranged spirally in three rows at the tips of the branches. 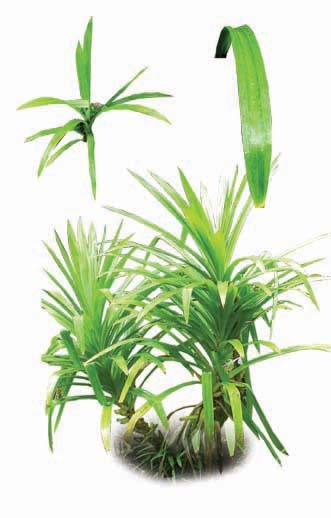 In fully exposed leaves, the midrib is bent, and the upper third or so of the leaf hangs down, giving Pandanus plants their characteristic drooping appearance. Leaf apex is long and flagella like. Underside the leaves, especially at the base two clearly demarcated very pale dull green strips are present, one on either side of the midrib. Margin of the leaves and midrib are prickled. Prickles are white or with dark tip, 3 to 5 mm long, slender and slightly curved. Prickles of the midrib are forwardly directed in the distal half of the leaves and downwardly directed in the lower half. Male and female flowers are in separate trees. Male inflorescence is a raceme of spikes, and male flowers are tiny, white, and fragrant with large showy bracts. They last only for about a day, with the inflorescence decaying within three to four days. Female inflorescence is pineapple like, composed of free or joined carpels, ripening as drupes (phalanges). Fruits are variable in shape, ovoid, ellipsoid, sub-globose or globose with tightly bunched, wedge shaped fleshy drupes, which are also referred to as keys. Fruits are green when unripe, orange or red or vermilion when ripe. Each drupe or phalange is covered with a pericarp (outer layer) and the middle layer or mesocarp is divided into upper and lower mesocarp. Upper mesocarp comprises an elongated cavern with tissue containing air spaces and lower mesocarp is fleshy and fibrous and this is the portion of the fruit that is chewed and eaten. Endocarp that covers the seed is hard and stony. Uses: It is an important component in the food security system of the Maldives and considered as the best source of food during famine and scarcity. Red portion of the ripe fruit is eaten raw. Juice, locally called as baipainkandhi, is extracted from the fruits by cutting them into small pieces, boiling them in water with sugar and then crushed and strained. Fruit is also used in various food preparations. It is cooked with rice and sugar to prepare a delicious traditional food called kashiko bondibaiy. A sweet soup, called kashiko baypeen, is prepared from the fruit. A sweet namely, kashiko foa is prepared by cooking pieces of fruits with sugar and wheat flour and sold in local market. Leaves, after thoroughly dried and prickles removed, are used to make a kind of soft mat called santhi. Prop root, locally called aloho, is used as a brush to paint boats. Hollow stems were once used to build houses but now are widely used to construct hargue, a place where boats are hauled for repair. Stems, which are fibrous and very soft, are widely used in making hulhuashi, a resting platform commonly found nearby the beach. Description: It is more or less similar to P. odoratissimus in appearance and morphological features. It also looks like a large branched candlestick or holder with numerous prop roots but is comparatively smaller in size than P. odoratissimus. In P. tectorius, prop roots sometimes emerge from the upper part of the trunk whereas in P. odoratissimus they emerge only from the base of the trunk. Leaf spines are larger and white or very pale in colour in P. odoratissimus whereas they are smaller and greenish in P. tectorius. Leaves of P. odoratissimus have two strips at the base, one on either side of the midrib. No such feature could be observed in P. tectorius. P. odoratissimus and P. tectorius are very close to each other taxonomically and they are thought to hybridize readily where they co-occur. Uses: Fruits of P. tectorius is normally not consumed in the Maldives because it causes an itching sensation on the tongue. Unlike P. odoratissimus, stems of P. tectorius are not widely used. Both the Pandanus species help to bind sand and prevent wind erosion, when they are grown on the seaward slopes and crests of frontal sand dunes. They also function as wind break. Since both the species are tolerant to salt spray, sand blasting, exposure to strong winds and high levels of solar radiation they can be part of multispecies bioshield for coastal area protection. Ecology, propagation and management: Pandanus spp. grow on a wide variety of coastal soils, including sandy and rocky beaches, raised coralline terraces and recent basalt (lava flows). They are adapted to shallow, saline, sodic, alkaline, and thin and nutrient poor soils over limestone and peaty swamps. They also grow well in soils with free or impeded drainage, including seasonally waterlogged soils. They are very tolerant of salt laden winds and salt spray and also of strong and steady winds. Pandanus spp. have a capacity to regenerate rapidly from seed in fallen fruit segment. It is not normally cultivated in the Maldives. However, it can be propagated by seed and branch cuttings. Seed can be collected from intact phalanges (keys) by keeping them in cool tap water for about five days, changing the water daily. Viable phalanges will float. They can be sown directly or propagated in a nursery. Seedlings 4 to 12 months old can be used for outplanting. Branch cuttings are made form shorter laterals including one or more aerial or prop roots and the length of the cuttings normally ranges from 20 to 40 cm. Leaf area of the branch cuttings is reduced by about 70% by cutting or trimming the leaves. Cuttings should be planted immediately after collection for high rate of establishment and growth. Status: Occasional; grown in home gardens as a spice. Description: A shrub that grows to 1 to 1.5 m height with spirally arranged sword-like leaves. Adult leaves are about 80 to 110 cm long and 6 to 8 cm wide with rather abruptly rounded or acute tip. Lateral pleats of leaves, well developed in other Pandanus species, are obsolete in Pandanus amaryllifolius. There is no spine in the midrib and margins of the leaves also lack any spine except at extreme apex where there may be a few minute prickles present. Male flowers are extremely rare and there is no scientific description of a female flower. Uses: It is the only Pandanus species with fragrant leaves and the aroma is distinctly pleasant, somewhat nutty and reminiscent of fresh hay. 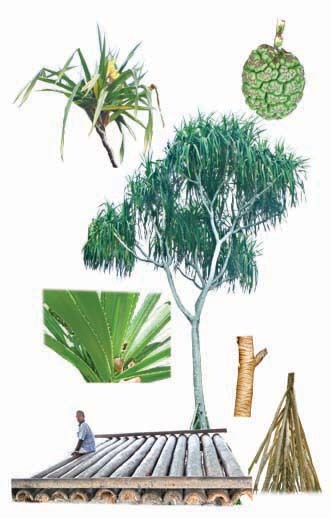 Scent of the Pandanus leaves develops only on withering; the fresh, intact leaves have no odour. In the Maldives, leaves are often used as a flavouring agent along with curry leaves or alone while cooking various curries. 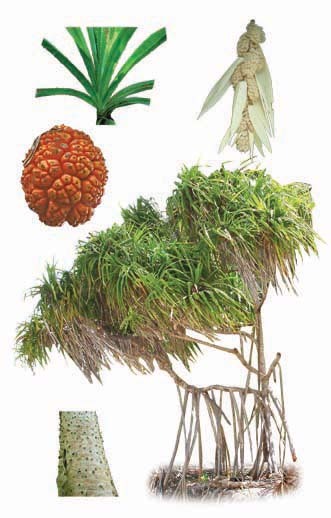 Ecology, propagation and management: Pandanus amaryllifolius is cultivated traditionally and it is not recorded in the wild. It is propagated by root suckers. Suckers 30 to 40 cm are carefully removed and planted in the kitchen garden. It requires regular but light watering for better performance. If there is no sufficient watering, leaves will become chloritic and aroma will not be strong.